Light and dark examples of Holbrookia maculata. Photo courtesy Simone Des Roches. 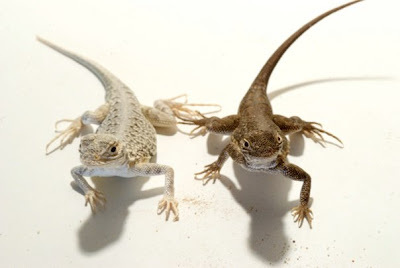 So, remember my posts back in February about three lizards that evolved lighter coloration after colonizing the white gypsum sand of White Sands, New Mexico, and about Erica Bree Rosenblum, the University of Idaho biologist who has studied them for most of her career? Sure you do. Well, Rosenblum’s grad student (and my former office-mate and continuing friend) Simone Des Roches has started a blog about her work at White Sands this spring and summer. Go check it out for the latest on Holbrookia maculata, and for Simone’s fantastic photography of the beautiful desert landscape and its inhabitants. While out of town for Science Online, I got word of a new blog worth following – two other University of Idaho doctoral students, Simone DesRoches and Kayla Hardwick, have started writing about a self-directed course they’ve set up at The Evolutionary Ecology of White Sands, NM. Simone and Kayla will be reading three classic evolutionary ecology texts, Dolph Schluter’s Ecology of Adaptive Radiation, Jerry Coyne and Alan Orr’s Speciation, and Robert MacArthur’s Geographical Ecology, and discussing them in the context of their research on the lizards of White Sands, New Mexico. Three distantly related species have all evolved white coloration after colonizing a region of white gypsum sands, each via a different genetic mechanism. (For more details, see Ed Yong’s excellent recent article about the White Sands lizards.) It’s a fascinating system, and the three books should make a great jumping-off point for discussing what’s known about it and what’s yet to be learned. 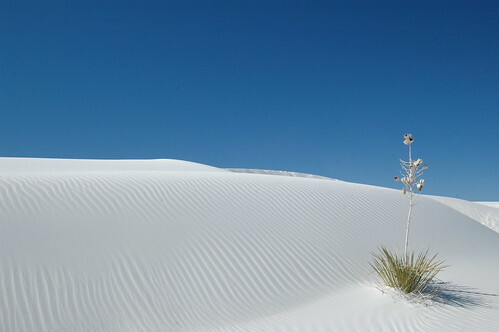 The white sands. Photo by Fabian A.M.